No matter how overwhelmed or scared a woman may be, she never has to abandon her baby. All 50 states, Washington D.C., and Puerto Rico have a Safe Haven Law. This law allows a woman to bring her baby to a certain locations or “safe havens” if she is unable to parent the child. No questions asked. Some examples of safe haven locations include fire departments, police stations, hospitals, and pregnancy resource centers. We’ll go through the details of the Missouri Safe Haven Law. But if you live in a different state, check out this guide to find out your state’s Safe Haven Law. A baby 45 days old or younger can be given to a safe haven, no questions asked. Who can give their baby to a safe haven location? Either of the baby’s biological parents can leave him or her with employees at a safe haven. Who can receive the baby? 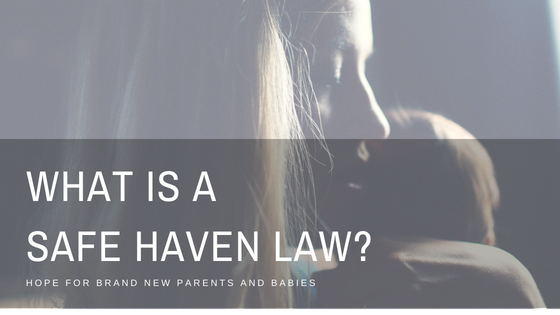 If a safe haven provider believes that the baby is 45 days old or younger, and the person delivering the baby is his or her biological parent, the safe haven provider must take physical custody of the baby. If the provider does not work in a hospital, they must immediately make plans to transport the baby to the nearest hospital. A safe haven provider is immune from civil, criminal, and administrative liability for accepting custody of a baby. That immunity won’t apply if they abuse or neglect the baby after accepting him or her. The hospital will make sure the baby is safe and healthy. The hospital will also let the Children’s Division and the local officer know about the baby. The juvenile officer will immediately begin protective custody proceedings. The officer will ensure that the baby becomes a ward of the court during the baby’s stay at the hospital. When the baby can leave the hospital, the Children’s Division will take physical custody of him or her. A parent voluntarily relinquishing their baby (giving them to a safe haven) isn’t required to provide any sort of information about him or herself or about the baby, like names or dates of birth or health information. However, that information about the baby would be really helpful for the new caretakers to know. No one can force you to give any information about yourself or the baby. The baby is 45 days old or younger when delivered to the safe haven. The parent delivers the baby safely to the physical custody of any safe haven provider, and lets that provider know that they do not intend to return for their baby. The baby hasn’t been abused or neglected by the parent before the voluntary delivery. Once the parent delivers their baby to the safe haven and states that they do not intend to return for the baby, that parent is giving up their parental rights and responsibilities for the child. If one parent gives custody of his or her child to a safe haven provider, the child’s other biological parent (non-relinquishing parent) can preserve his or her parental rights by working with the Children’s Division and juvenile court. The Children’s Division will make a public notice about the child. After that, the non-relinquishing parent has 30 days to take the steps necessary to establish parentage. If the non-relinquishing parent asks the hospital about their baby, the hospital must refer the parent to the Children’s Division and juvenile court. Lifeline Pregnancy Help Clinic is a safe haven provider. If a parent leaves his or her child with us, we’ll make sure that baby gets all the care he or she needs. We exist to help anyone facing an unexpected pregnancy, free of judgment and full of compassion. Our hope is that women and men get the help they need before faced with a decision to deliver their baby to a safe haven. We offer confidential pregnancy tests, ultrasounds, education, counseling, and community referrals at no cost. If you have any questions or want to know more about Lifeline, contact us today.